Staff from HMT Sancta Maria Hospital. Image by Martin Ellard. 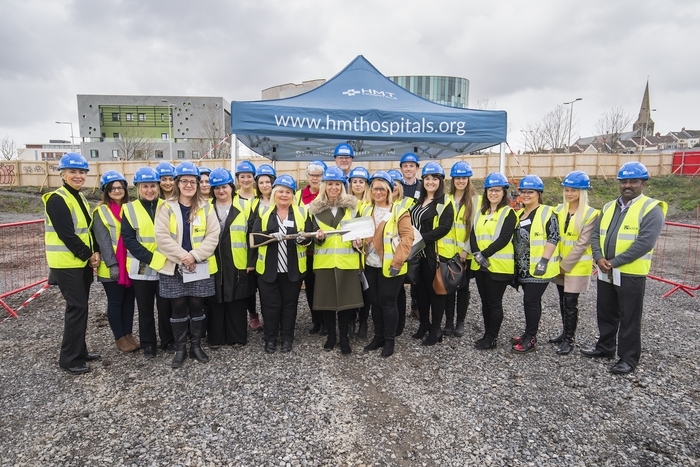 HMT Sancta Maria Hospital has broken ground on the site of its new purpose-built hospital in SA1. A turf cutting ceremony was held yesterday to mark the beginning of construction of the state-of-the-art hospital which will open its doors in Autumn 2020. The new hospital will dramatically improve the patient experience with new diagnostic equipment, including an MRI scanner, purpose-built consulting and ward rooms and on-site parking. HMT Sancta Maria Hospital is currently based on Ffynone Road in Uplands. This move signals the start of the next chapter for the private hospital which is owned by registered charity, the Healthcare Management Trust (HMT). HMT Sancta Maria is leasing the plot, on Langdon Road in SA1, from the University of Wales Trinity Saint David (UWTSD). Following the opening of the new University campus in SA1 in September last year, the new hospital marks the next major development in the area and forms part of the wider regeneration of central Swansea. Kier has been awarded the contract to build the hospital. As a socially-conscious organisation, Kier is committed to working alongside the local community and being a good neighbour. Through its CSR activity, the company will keep local residents informed of the progress, and work with local schools on education programmes that will add value and inspire young people. Jason Taylor, Operations Director for Kier Wales said: “Kier has a successful pedigree in delivering large scale projects in the healthcare market over the last 10 years, with over 200 projects successfully delivered. “We are delighted to be bringing this expertise, alongside our dedicated local knowledge, to be partnering with HMT and Gardiner and Theobald to deliver this amazing facility. Kier is delighted to have been chosen to deliver the project in partnership with HMT and Gardiner and Theobald. The unique state-of-the-art private hospital location is a principal gateway into the city, further enhancing the good name Sancta Maria has within Swansea. Its design will be consistent with the SA1 surrounding buildings and will be an excellent addition to the wider regeneration of the city. Professor Medwin Hughes, DL, Vice Chancellor of UWTSD, said: “Our vision for SA1 Swansea Waterfront is to create a neighbourhood where people can study, work, live and spend their leisure time. In SA1 collaboration and partnership are the key drivers for teaching, learning and innovation. Together, with our partners we are developing new provision to address skills gaps, creating enterprise hubs and accelerator schemes to grow new businesses, developing the skills of current businesses and attracting new investment into the region. The turf cutting ceremony was attended by representatives from the HMT group, HMT Sancta Maria Hospital, Kier, UWTSD and Swansea Council. Speeches were delivered by stakeholders including Medwin Hughes, Vice Chancellor of UWTSD and Cllr Clive Lloyd, Deputy Leader of Swansea Council. The first turf was cut by John Folliott Vaughn, HMT Chairman of Trustees. Also in attendance was Geoff Bailey, the newly appointed Hospital Director of HMT Sancta Maria Hospital. Geoff joined Sancta Maria in February and will oversee the hospital’s move to its new facilities.